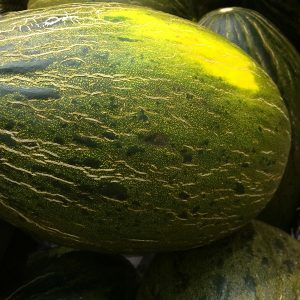 A old variety from Spain Piel de Sapo is a melon that grows well in many areas of Australia. Oval shaped and reaching around 30 cm (12 inches) in length, the flesh is tasty and sweet. It has good keeping qualities. The taste is reminiscent of the Honeydew Melon however the flesh is crisper with a little more crunch. The fragrance is a little like passionfruit. Being easy to grow it is a popular melon for the home garden and can be grown from seeds. You can use seeds from a melon purchased at a market, or buy seeds online. Germination rates are usually good. Seeds can be sown directly or started in pots indoors. Seedlings should not be planted out until after the last frost. A position in full sun is essential. Prepare a humus rich well drained soil. Plant the seeds directly, or seedlings, after the danger of frosts is over. Protect the seedlings from slugs and snails. Mulch around the plants to retain moisture. Keep the plants moist, however never wet and soggy soil. In cooler climates Piel de Sapo can be grown in a poly tunnel to increase warmth. If you want the melons to last a long time, harvest them and let them ripen off the vine. If you want the nest taste, let them ripen on the vine. They are ripe when the skin begins to turn yellow. Also known as the Santa Clause melon and Christmas melon, it is easy to prepare to eat. You can split the melon in half, scoop out the seeds and then scoop out pieces of melon to eat. These melons make a great breakfast food, as well as a good desert. You could make melon balls, use it fruit salads, or use it to make smoothies. You can save the seeds for planting the next season. Clean the seeds, allow them to dry and keep them in a cool dry position until ready for planting.